It’s safe to say that out of 10, nine of us Malaysians have something deep inside our soul that inherently craves McDonald's AT LEAST once or twice a month (it’s perfectly normal to have more than that). It’s the closest thing to heaven's gift from above. Plus, they are the cure to any bad day. However, we can see that McDonald’s price is slowly increasing. Of course, this didn’t stop us from spending at this food place, but don’t you think it’ll be even better if we can get it at a CHEAPER price? Well, the good thing is you can - if you scan through the menu carefully and be calculative about it. To assist you with this, here are six ways to help you save money at McDonald’s. There are three options for Chicken McNuggets (a’la carte) - 6 pieces (RM7.10) or 9 pieces (RM9.90) and the 4 pieces (RM3.80). Instead of opting for 6 or 9 pieces, buy a few of the 4-piece nuggets. Here’s an example: 2 boxes of 4 pieces of nuggets will cost you RM7.60, which is better than a box of 6 pieces of nuggets. 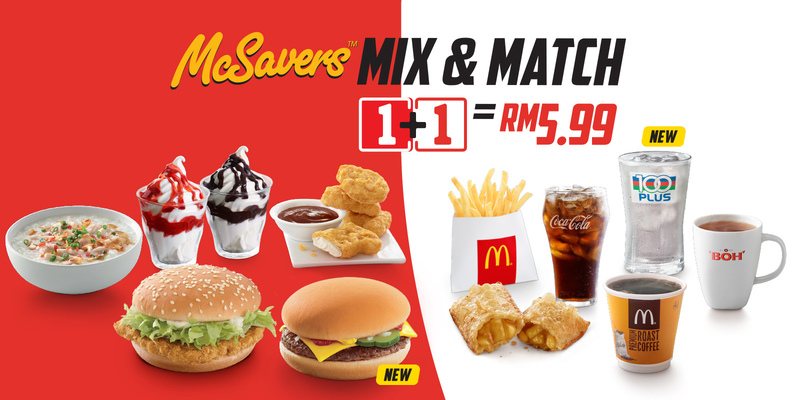 Not only do you get to save RM1.24, you have two extra nuggets too. How? Side note: It’s not in the menu, but you can ask for it. Also, it’s not available for McDelivery. This is for those who have been dreaming about McDonald’s, but are also on diet - get the Happy Meals! They cost less and generally satisfy your McD cravings. If you’re not in the mood for fries, you can swap the fries to a cup of corn. On top of that, you get FREE toys too. To some people it’s just a child’s plaything, but not for the opportunist. If you’re lucky, you might get some jackpot collectable items that could actually make you a lot of money. Remember when people went gaga over the Minion toys back in 2013? 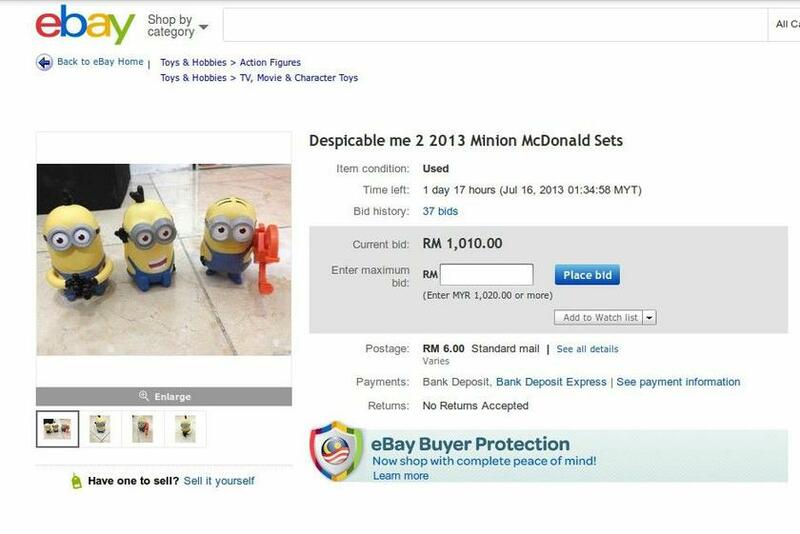 As reported by the Malay Mail, people were auctioning the toys on eBay for crazy prices. Instead of choosing a’la carte or value meals, opt for the bundled meals to save more money. 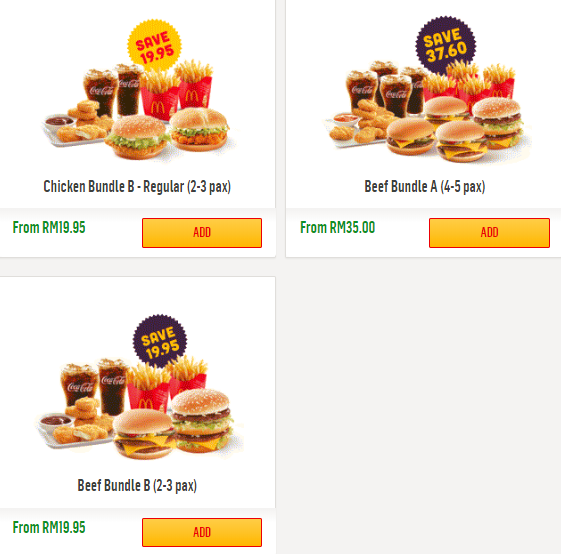 For example, buying regular value meals for McChicken (RM12.25), Spicy Chicken McDeluxe (RM16.05) together with 6 pieces of Chicken McNuggets (RM8.50) would cost you a total of RM36.80. So it’s better to order the Chicken Bundle B, which would cost you almost half of the price. This works wonders if you’re ordering with friends or colleagues, but you have to make sure everyone agrees on the type of meat - chicken or beef. If not it’ll definitely cost you more. But this also works if you’re alone. You can save another set for later. Who doesn’t love offers, right? Which is why you have to download the app from Google Play or App Store - it’s a bit ‘mafan’, but worth it. Once registered, you can claim FREE McChicken and then, from time to time, McDonald’s will send you exclusive offers that are available for a limited time only. Let’s take the D24 Durian McFlurry frenzy, for instance. 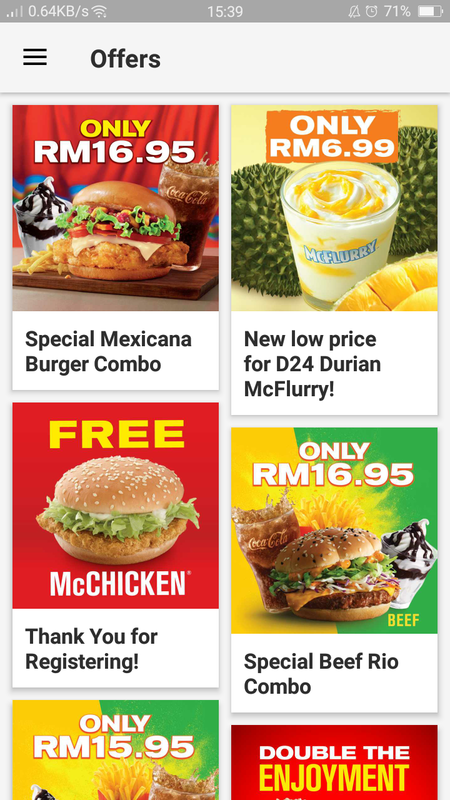 With the app, you can get the ice cream for RM6.99 instead of RM7.99. Yes, it’s just a RM1 difference, but it’s still a saving. Other promos that can be found include the Chicken Rio Combo for RM15.95, free Coca-Cola when you purchase the Spicy Chicken McDeluxe and Snack Combo (french fries and sundae) for RM5.95. 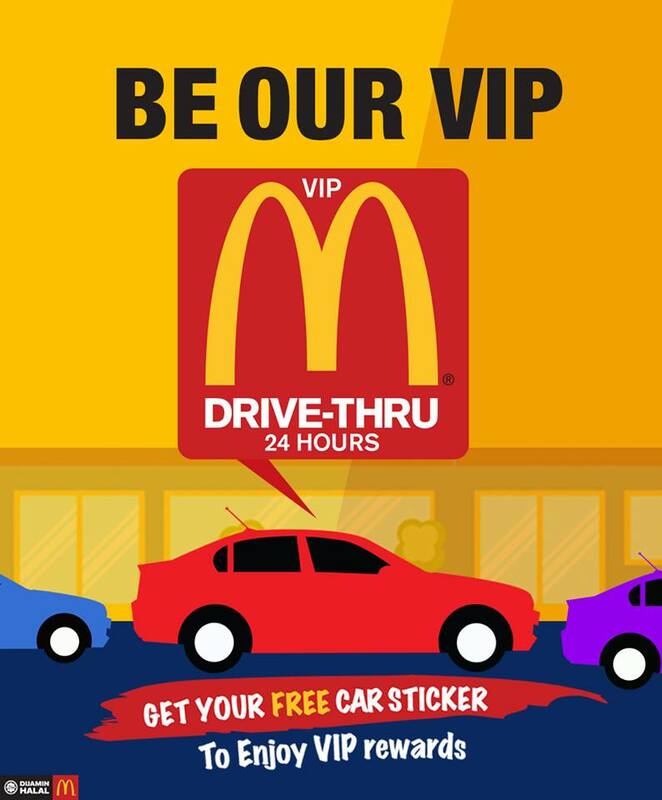 If you’re a busy bee and love the drive-thru option, make sure you have the VIP car sticker. You’ll get free things with every purchase above RM20. The items vary from time to time - sometimes you’ll get fries, burger, apple pie - it depends on the excess stock they have. So, how do you get the sticker? Just ask from the staff. Another thing to take note is to always point out the sticker because the staff can sometimes overlook and you won’t be getting your free items. This is a pretty well-known art among McDonald’s fans. For this option, we would recommend you to take one of the burgers or Bubur Ayam McD with french fries or apple pie. Why? Because for RM5.99, these are the most filling ones. As for the drinks, just bring your own because when on a budget, the first to be cut are drinks and desserts. Did we miss something out? We hope you found these tips helpful, and please, if you know any more, do share them with us, and we can all have a little fun during our next fast food run!